(Reuters) - A baby girl in Mississippi who was born with HIV has been cured after very early treatment with standard HIV drugs, U.S. researchers reported on Sunday, in a potentially ground-breaking case that could offer insights on how to eradicate HIV infection in its youngest victims. 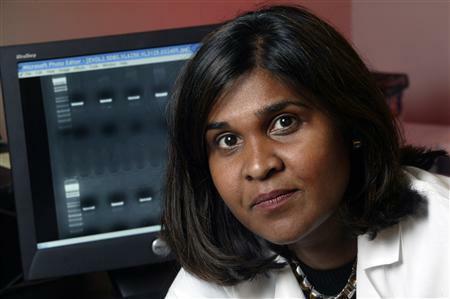 "This is a proof of concept that HIV can be potentially curable in infants," said Dr. Deborah Persaud, a virologist at Johns Hopkins University in Baltimore, who presented the findings at the Conference on Retroviruses and Opportunistic Infections in Atlanta. The child's story is different from the now famous case of Timothy Ray Brown, the so-called "Berlin patient," whose HIV infection was completely eradicated through an elaborate treatment for leukemia in 2007 that involved the destruction of his immune system and a stem cell transplant from a donor with a rare genetic mutation that resists HIV infection. "We believe this is our Timothy Brown case to spur research interest toward a cure for HIV infection in children," Persaud said at a news conference. When the baby girl was born in a rural hospital in July 2010, her mother had just tested positive for HIV infection. Because her mother had not received any prenatal HIV treatment, doctors knew the child was at high risk of infection. They transferred her to the University of Mississippi Medical Center in Jackson, where she came under the care of Dr. Hannah Gay, a pediatric HIV specialist. Researchers believe use of the more aggressive antiretroviral treatment when the child was just days old likely resulted in her cure by keeping the virus from forming hard-to-treat pools of cells known as viral reservoirs, which lie dormant and out of the reach of standard medications. These reservoirs rekindle HIV infection in patients who stop therapy, and they are the reason most HIV-infected individuals need lifelong treatment to keep the infection at bay. After starting on treatment, the baby's immune system responded and tests showed diminishing levels of the virus until it was undetectable 29 days after birth. The baby received regular treatment for 18 months, but then stopped coming to appointments for a period of about 10 months, when her mother said she was not given any treatment. The doctors did not say why the mother stopped coming. When the child came back under the care of Dr. Gay, she ordered standard blood tests to see how the child was faring before resuming antiviral therapy. What she found was surprising. The first blood test did not turn up any detectible levels of HIV. Neither did the second. And tests for HIV-specific antibodies, the standard clinical indicator of HIV infection, also remained negative. "At that point, I knew I was dealing with a very unusual case," Dr. Gay said. Baffled, Dr. Gay turned to her friend and longtime colleague, Dr. Katherine Luzuriaga of the University of Massachusetts, and she and Persaud did a series of sophisticated lab tests on the child's blood. The first looked for silent reservoirs of the virus where it remains dormant but can replicate if activated. That is detected in a type of immune cell known as a CD4 T-cell. After culturing the child's cells, they found no sign of the virus. Then, the team looked for HIV DNA, which indicates that the virus has integrated itself into the genetic material of the infected person. This test turned up such low levels that it was just above the limit of the test's ability to detect it. The third test looked for bits of genetic material known as viral RNA. They only found a single copy of viral RNA in one of the two tests they ran. Because there is no detectible virus in the child's blood, the team has advised that she not be given antiretroviral therapy, whose goal is to block the virus from replicating in the blood. Instead, she will be monitored closely. There are no samples that can be used by other researchers to confirm the findings, which may lead skeptics to challenge how the doctors know for sure that the child was infected. Persaud said the team is trying to use the tiny scraps of viral genetic material they have been able to gather from the child to compare with the mother's infection, to confirm that the child's infection came from her mother. But, she stressed, the baby had tested positive in two separate blood tests, and there had been evidence of the virus replicating in her blood, which are standard methods of confirming HIV infection. Dr. Anthony Fauci, director of the National Institutes of Allergy and Infectious Diseases, said although tools to prevent transmission of HIV to infants are available, many children are born infected. "With this case, it appears we may have not only a positive outcome for the particular child, but also a promising lead for additional research toward curing other children," he said. Dr. Rowena Johnston, vice president and director of research for amfAR, The Foundation for AIDS Research, which helped fund the study, said the fact that the cure was achieved by antiretroviral therapy alone makes it "imperative that we learn more about a newborn's immune system, how it differs from an adult's and what factors made it possible for the child to be cured." Because the child's treatment was stopped, the doctors were able to determine that this child had been cured, raising questions about whether other children who received early treatment and have undetectable viral loads may also be cured without their doctors knowing it. But the doctors warned parents not to be tempted to take their children off treatment to see if the virus comes back. Normally, when patients stop taking their medications, the virus comes roaring back, and treatment interruptions increase the risk that the virus will develop drug resistance. "We don't want that," Dr. Gay said. "Patients who are on successful therapy need to stay on their successful therapy until we figure out a whole lot more about what was going on with this child and what we can do for others in the future." The researchers are trying to find biomarkers that would offer a rationale to consider stopping therapy within the context of a clinical trial. If they can learn what caused the child to clear her virus, they hope to replicate that in other babies, and eventually learn to routinely cure infections.